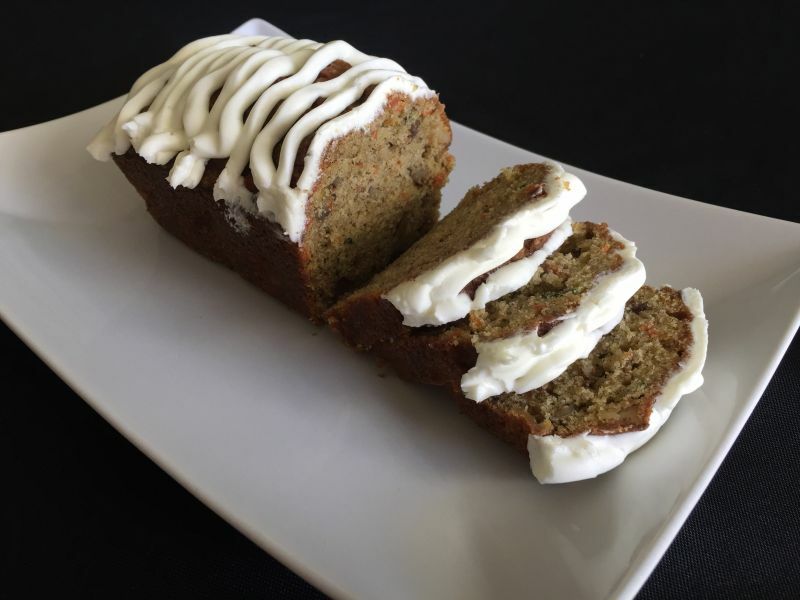 Zucchini, Apple and Carrot Loaf. There: I said it. After I submitted my post for last week, Amber told me that I needed to say what it was I was making in the beginning of my post. It turns out that for the last year and a half she has been “tweaking” my posts so that the recipe title is in the first paragraph. It has something to do with search engine optimization (whatever that is). Since I love her so very much, I am trying to be search engine compliant and get that recipe title in there right away. I am sure she is grinning from ear to ear at this very moment because I am trying so hard to do things the right way. Although I think she may be muttering under her breath that sounds like “that little smart arse….” There is a reason she does all the computer end of the blog. I can barely see my way through typing up a word document. My true love is the kitchen, and thankfully, I have nothing more complicated than the digital timer to figure out. She is the computer genius, so together we make a good team. Amber comments: I’m sitting here shaking my head laughing as I read. LOL! 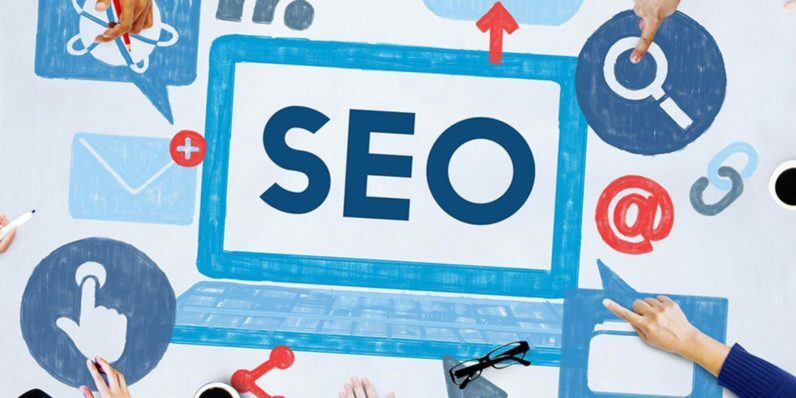 SEO or Search Engine Optimization gets us all crazy. Good Job April for saying it in the first paragraph. I love to grow my own fruits and vegetables also, and this year is no exception. 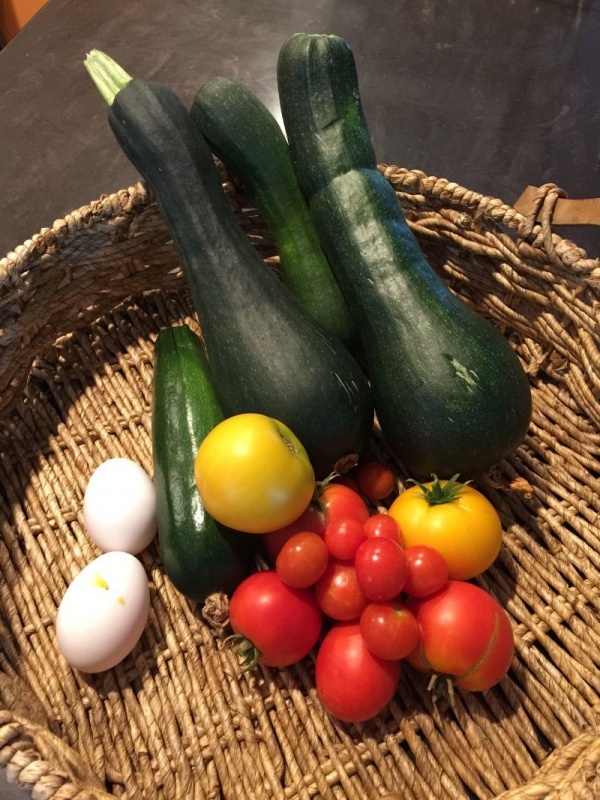 I went out this morning and picked a couple of small zucchini, some tomatoes, and then gathered a couple of eggs. I also have an apple tree, which comes in quite handy when it’s time to make something yummy and sweet! 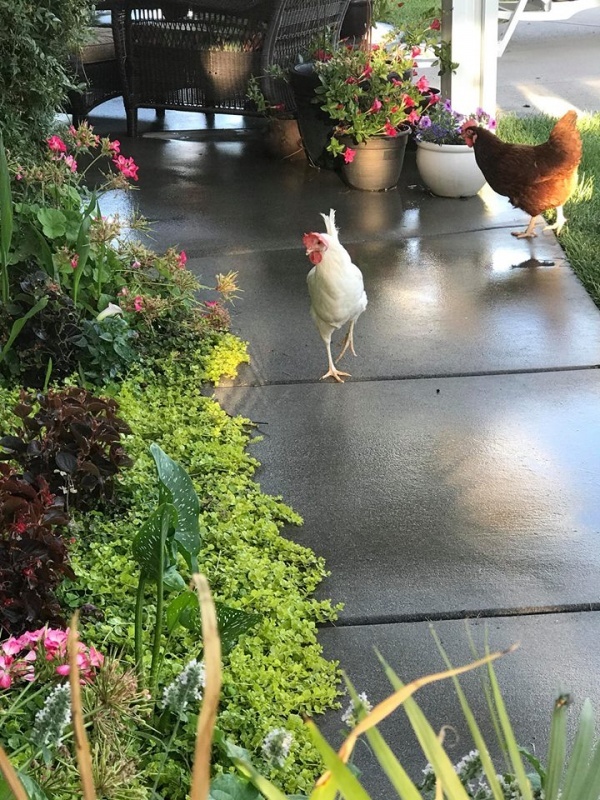 April’s chickens – or babies as she likes to call them… talk about free range eggs! 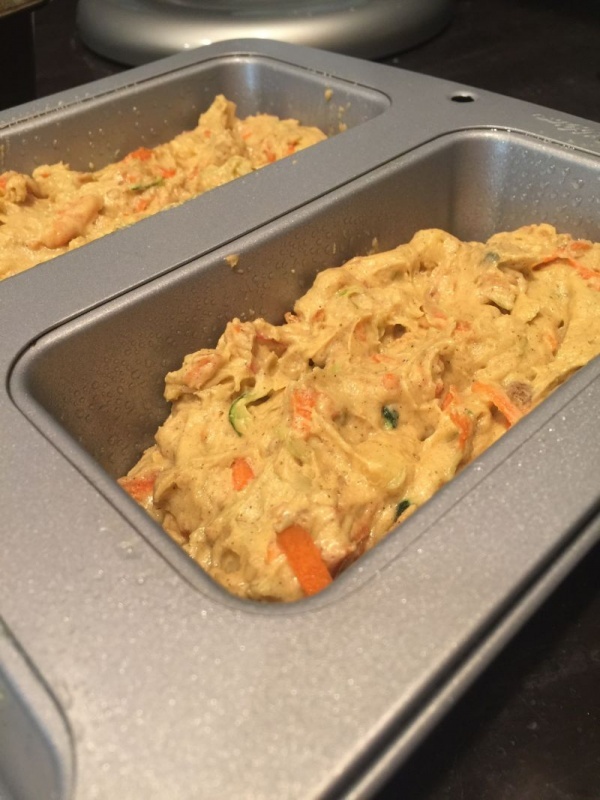 Amber comments: People ask me all of the time why I don’t write the recipes for our blog. The simple answer is look above. As crazy as I am, I don’t farm in my own backyard like April does. She’s amazing and there are few people I know who are as creative and talented as she is. She’s like Martha Stewart, Ree Drummond and Nigella Lawson all rolled up in one. I just love her recipes – don’t you? 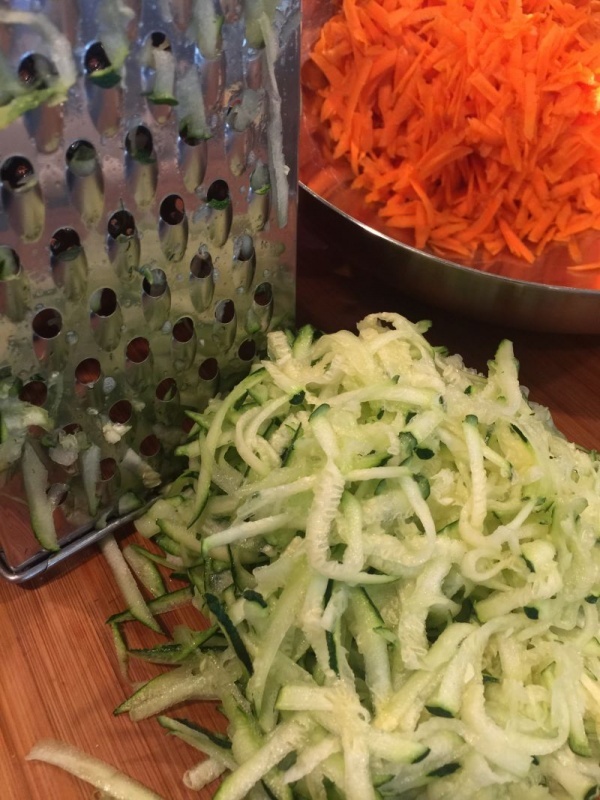 Now before you put this down because I said zucchini– hear me out. This recipe is nothing like the loaves of zucchini bread you exchange at the end of the harvest season with all your neighbors because you can’t get rid of all the squash in your garden. 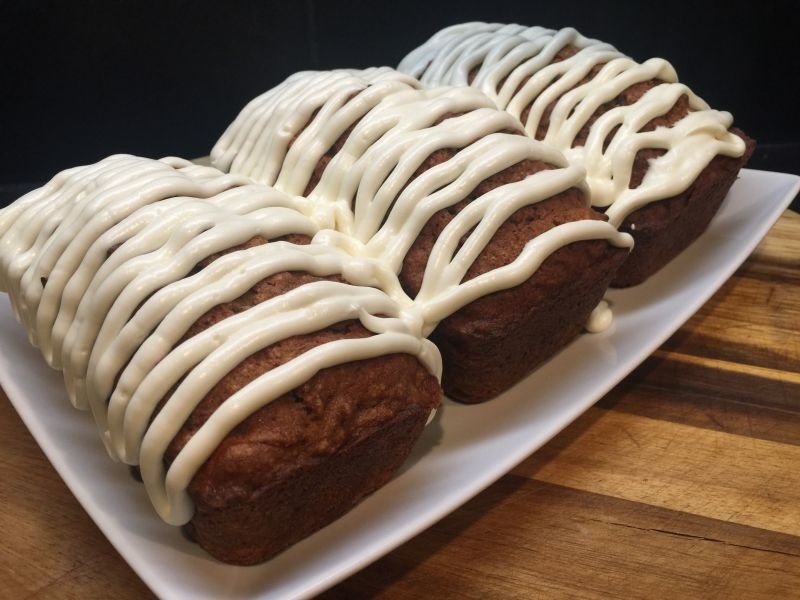 This tastes more like a dessert loaf, especially with the delicious icing drizzled over it. It is moist, perfectly dense, and loaded with nutrition! Plus, it freezes beautifully, so if you want to get your holiday baking done in advance you can make it up in small or standard loaves, double wrap and freeze. Add the icing after you thaw it out. I am not kidding, this loaf is a wonderful substitute for breakfast with a cup of coffee or hot spiced cider. Or you can serve it after dinner as a dessert and add a dollop of whipped cream and sprinkle of cinnamon. I was actually going to show you a pretty picture of it served with whipped cream but my family ate it all up before I could photograph a piece! Thats my story and Im sticking to it! 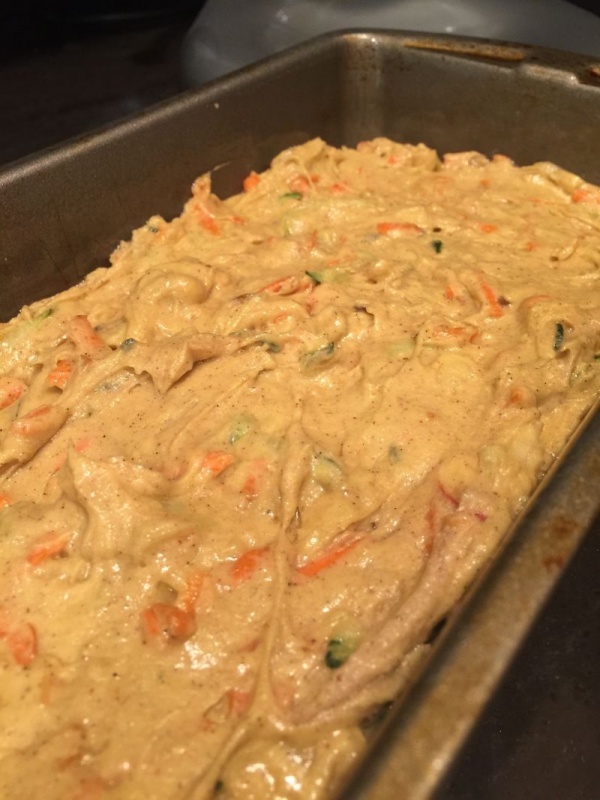 Amber comments: I admit it, I love this type of spicy, flavorful and moist loaf. 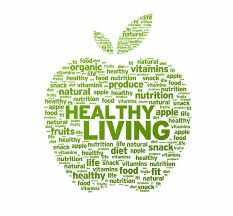 I often make it telling myself that it is healthy because it has fruit and veggies in it. You see where I am going with this right??? Making this is super easy, and turns out perfect every time. 4. In a large mixing bowl put the flour, baking soda, salt, baking powder, cinnamon, cloves, and nutmeg. Mix together and set aside. 5. 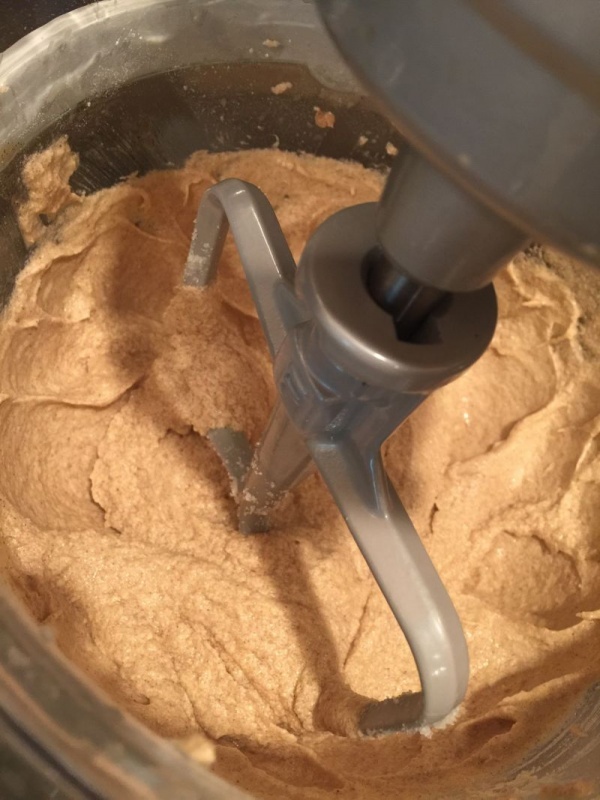 In a second large bowl or stand mixer bowl, mix together the butter and sugar until creamy. 6. Add the eggs, orange juice, vanilla and orange zest and mix well. Shh.. it only looks like cake batter. 7. Add the flour mixture to the creamy mixture you just made, 1/2 cup at a time, until thoroughly mixed together. If you are using a stand mixer, use the paddle attachment, not the whisk attachment, for this. Look at all of this healthy goodness going into the loaves. 8. 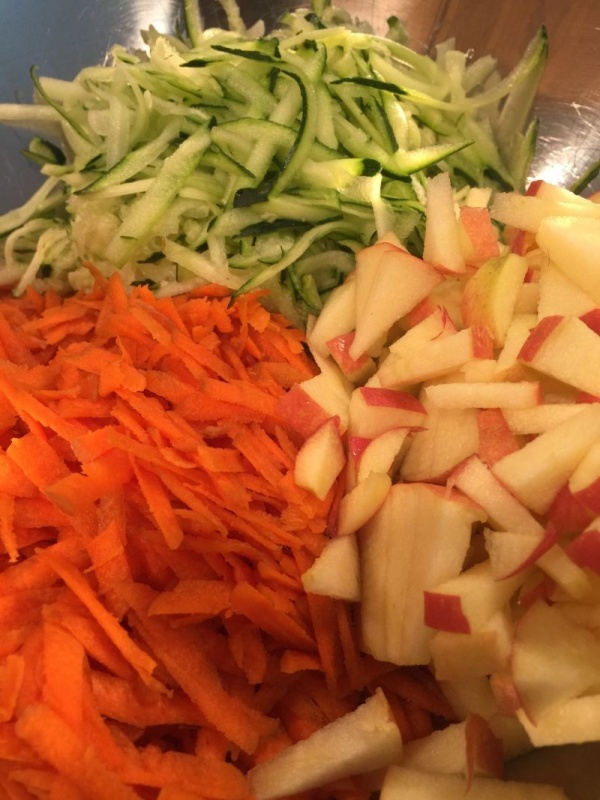 Fold in the prepared zucchini, carrots, apples and chopped nuts. Can’t you almost smell these loaves baking in your oven? 10. Bake until golden brown, about 60 minutes, or until the loaves spring back when gently pressed on the top with your fingers. 11. Allow to cool slightly and then tip out of the loaf pans, peel off the paper from the bottom and cool on a rack completely before icing. 1. Cream together the butter and cream cheese with a mixer. 2. Sift the powdered sugar and add 2 cups to the cream cheese mixture, and mix with electric mixer until smooth. 3. Add orange juice one tablespoon at a time until the icing is a thin as you desire. 4. Drizzle or spread the icing over the cooled loaves. 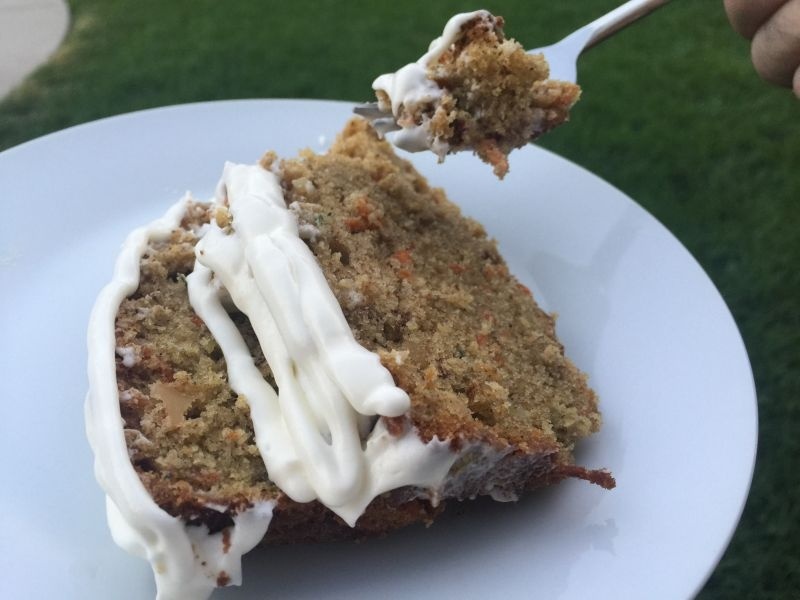 Ok, so the icing isn’t so healthy – but hey, it tastes good! See, I told you it was easy! This delicious loaf is beautiful with the little speckles of orange and green! I just know you are going to love it as much as our family does! I’m with you both. This recipe sounds delicious, I would love to have my own chickens and I too am annoyed by SEO. You made me smile with this post!